Background: Cervical cancer is the second leading malignancy for women. In developing countries, it is becoming a public health trouble in adult women. Persistent cervical infection with high-risk human papillomavirus (HPV) may contribute to the development of cervical cancer. The danger is in the fact that woman with HPV can go unnoticed for years. So, women with early cervical cancer and pre-malignant neoplastic disease show no symptoms, until cancer becomes invasive and grows into the nearby tissue. A large number of females die from the disease each year due to late diagnosis and resistance to conventional treatment. In particular, in advanced tumor stage, low response to chemotherapy results in poor prognosis and recurrence. Therefore, new therapies and indicators are needed to overcome chemo-resistance as well as early diagnosis of cancer. There is a continuous search for prognostic and predictive markers in order to help optimize and personalize treatment for improvement in the outcome of cervical cancer. Recent Findings: Non-coding regulatory RNAs that control gene expression at the posttranscriptional level are seeking the attention of scientists in this area. Certain microRNAs have been located near cancer susceptibility loci that correlate tumorgenesis. Multiple profiling studies have revealed a significant change in miRNA expression in cervical cancer patients. 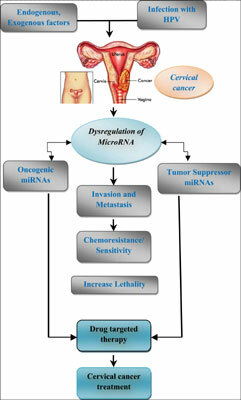 A number of miRNAs have shown a consistent up-regulation or down regulation throughout the different stages of cervical cancer. Conclusion: Investigation of microRNAs involved in carcinogenesis and progression of cervical cancer in tissue-specific manner is opening a window in early diagnosis and therapeutics. Cervical cancer, carcinogenesis, microRNA, oncomir, tumor suppressor RNA and therapeutics, chemotherapy.